At this very moment, thousands of people in Midtown Manhattan are designing and manufacturing apparel all within a 10-block radius in New York City’s Garment Center. The innovation, opportunity, and jobs that the Garment Center provides is essential not only to the New York City economy but also to the American fashion industry as a whole. In this 100-year-old neighborhood, the trim-and-fabric suppliers, pattern-makers, sewers, pressers, and finishers act as a self-sustaining ecosystem, providing support for established and emerging designers all over America. For the nascent designer, the resources and mentorship these local businesses offer are invaluable, not to mention incomparable. Losing this base would put the future of American fashion in jeopardy. The clustering of all of these resources makes the neighborhood a fashion research-and-development hub unmatched by any other city in the world. For the nascent designer, the resources and mentorship these local businesses offer are invaluable, not to mention incomparable. When it comes to manufacturing, proximity offers both environmental and competitive advantages. A brand manufacturing in the Garment Center has direct access to its production. It’s able to constantly monitor the quality of their product, as well as tighten its supply chain to avoid excess inventory and waste. When production is readily accessible to both the designer and the consumer, it improves the quality and the speed at which garments can be produced. Shipments that roll down the street, rather than fly in from abroad, drastically reduce the carbon footprint of apparel manufacturing. Manufacturing jobs in this district have provided a sustainable and steady middle-class living for the skilled labor in our factories for decades. Domestic manufacturing is a viable economic solution and the American people are beginning to realize its role in job creation, innovation, and sustainability. 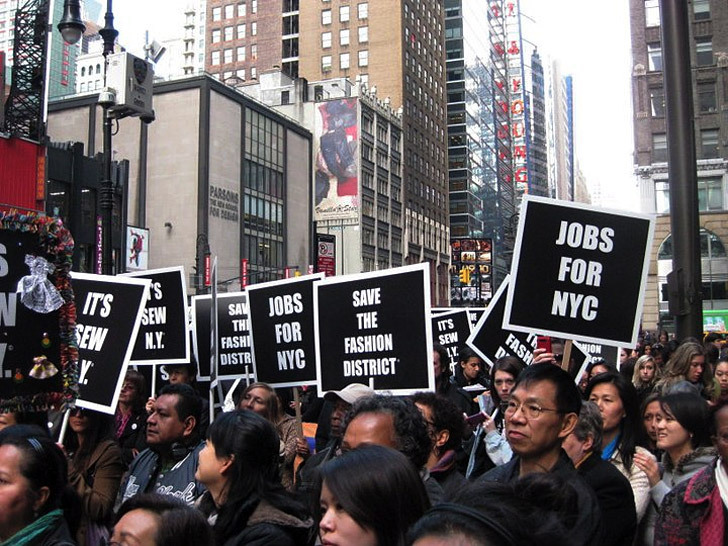 To save the Garment Center means more opportunities for designers, middle-class New Yorkers, and fashion companies all across America. It should be saved because New York is ALL about FASHION!!!! At this very moment, thousands of people in Midtown Manhattan are designing and manufacturing apparel all within a 10-block radius in New York City�s Garment Center. The innovation, opportunity, and jobs that the Garment Center provides is essential not only to the New York City economy but also to the American fashion industry as a whole. In this 100-year-old neighborhood, the trim-and-fabric suppliers, pattern-makers, sewers, pressers, and finishers act as a self-sustaining ecosystem, providing support for established and emerging designers all over America.